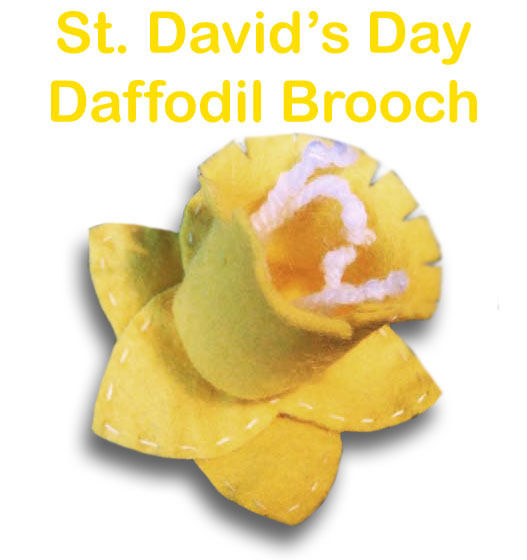 Because I can not just go out and buy a daffodil pin (like you can in Wales) I decided I would make one from felt and wanted to share how I made it for anyone else who would like to wear one! 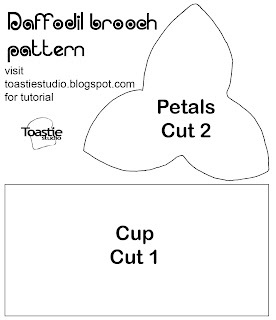 Print off the following pattern and cut the pieces out of yellow felt. You will also need 2 pieces of string or wool, each 4 inches long with a knot at each end. Sew the yellow rectangle into a cylinder as shown below. And snip around the top edge to make a bit of a fringe. If you like you could get decorative and make it look even more like a daffodil. Also if you have a soft felt, pull and mold the top edge out to look more like a daffodil as I have. (although this may not work for all felt types). Sew around the edge of each of the petal shapes (this gives them some detail and extra strength) And lay them on top of each other like this. Attach a brooch bar to one side of your petals and attach the two pieces of string to the other by folding them in half and sewing over the middle of each. Now it should like something like this. Now it gets a little tricky. Do a running stitch around the bottom of the daffodil cup we made earlier. Then place the knotted ends of the wool inside the cup and pull the running stitch to gather the bottom of the daffodil cup around the wool. Make gather as tight as you can and knot the thread. This entry was posted in Felt, Tutorials on February 28, 2011 by Handmade Cuddles. This week I bought this to die for fabric from my local market. It was €2 a meter!! How cute is it!! Perfect for some baby gift or toy… I just have not decided what to use it on just yet. Any ideas? And also this lovely parcel of felt is in the post to Danielle. All my eco-fi felt is currently on sale in my Etsy shop. €5.00 for 10 sheets, or I can do custom listings for more sheets. 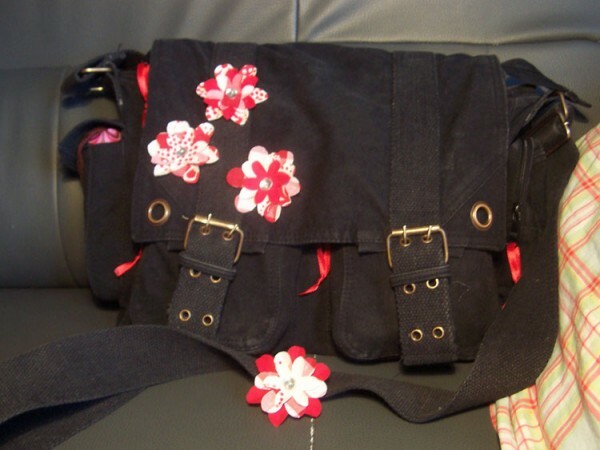 This entry was posted in Fabric on February 26, 2011 by Handmade Cuddles. I love flowers! And as spring is slowly arriving here I though I would give my book bag a fresh bright feel by adding some to it! Here is what my bag looked like, very black and boring. And next to it is my new spring bag! I love it! And I love it so much I thought I should share how I did it. First you can either use this pattern, or draw your own. 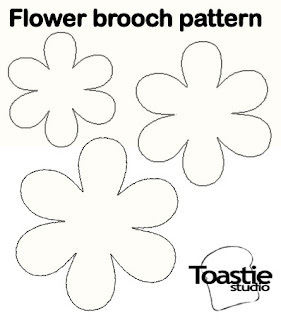 Pick three fabrics and cut out three small squares big enough for each of the flower templates. Ideally you would now use some fabric stiffener, but I don’t have any of this so I use a mix of 2:1 pva and water. Coat the fabric with the mixture and leave to dry. Your fabric should be nice and stiff now and wont fray when you cut out your flowers. 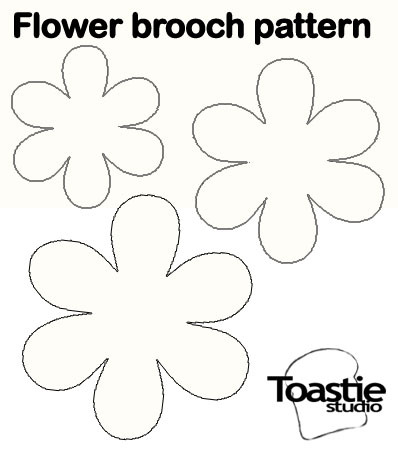 Draw around each template on the reverse of your fabric and cut out your flowers. I made enough for 5 flowers. Cut out each flower and layer the three flowers on top of each other. Sew through the middle of the flowers onto…anything you like. I sewed 3 of my flowers onto my bag, 1 I turned into a brooch and the other I am keeping for something else (surprises!). You could turn the flowers into lots of other things too. To finish off the flower either use a button, or a stick on gem and glue it to the middle of the flower to hide the stitches. For extra depth pinch the tip of each flower petal so it makes a bit of a curve. And there it is all finished! Bag and boorch! This entry was posted in Fabric, Tutorials on February 25, 2011 by Handmade Cuddles. It is a little (ok a lot) off topic but I thought I would share this little recipe that I used to make yummy healthy treats for my rabbit, Tulip. They were super easy to make, cheap and don’t have some of the bad things they put in commercial treats! They would also be a real fun project for the kids to help make, get them involved in taking care of the rabbit! Peel and break up the bananas into the bowl and use a fork to mash it up with the oats and carrot. Give it all a good mix together. Pre-heat the oven to 190*C and place some baking paper onto two trays. Spoon out little bits of oat mixture and make small drops on the trays and squish them down to a more flat shape. (You could make them any shape, but try to keep them small as too much treats are bad for bunnies). Bake in the oven for 15-20 minutes, let them cool on the trays before storing them in an air tight container and rewarding your little bunnies when he/she is a good boy/girl!! I just have to reach for the jar mine are kept in and Tulip gets all excited and runs up for one! This entry was posted in Life, Recipes on February 22, 2011 by Handmade Cuddles. For awhile now I have been considering if I should open a Folksy shop. I am all yes, no, yes, maybe, argh!! So I wanted to ask other people what they think? Do you have a Folksy shop? Do you also have an Etsy shop? Which do you find is better? Do you mostly get European sales on Folksy? Any opinions, problems, successes or information is greatly received. I know I would never pay more postage for an item than I am paying for the actual item and my main principle with all the things I sell is I wont charge more than I would pay myself, even if the time put into them is worth more. This entry was posted in Plans on February 21, 2011 by Handmade Cuddles.